UNIQUELY DESIGNED - We have uniquely designed our serum to have a thinner consistency as this will absorb quicker into your skin and not leave your skin looking greasy or oily. ALWAYS perform a "patch test" for 24 hours on your hand with a small amount of the product before full use. 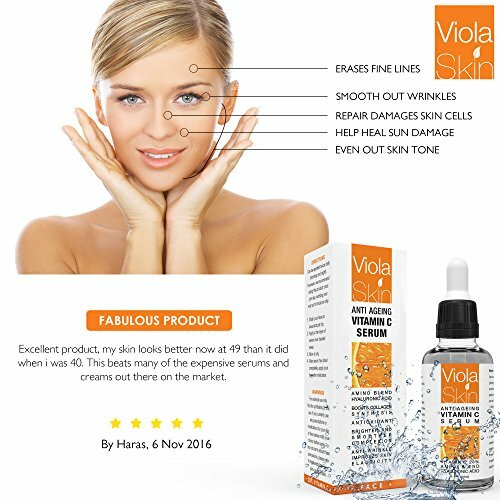 HIGH QUALITY - Bring out your beauty with ViolaSkin's powerful Vitamin C Serum. This potent face serum, made with the highest quality ingredients and rival of the most expensive big-brand anti aging creams, will brighten, smooth, and moisturize your complexion while repairing sun damage and evening out skin tone. On top of that, it also naturally lifts and firms your skin, helps erase fine lines, and smoothens out wrinkles - making it the ultimate anti ageing hyaluronic acid serum! POWERFUL ANTI AGEING INGREDIENTS - Jojoba Oil, Aloe, and an Herbal Infusion come together to reduce redness and moisturize the skin. HYALURONIC ACID plumps the skin and effectively treats wrinkles & fine lines. MSM clears up blemishes and helps relieve itchiness and dryness. And VITAMIN C helps replace old skin cells with newer, healthier ones - rejuvenating your face inside and out! BOOST YOUR CONFIDENCE AND LOOK GREAT - Because what good is a pretty product when it's not created in the best way possible? ViolaSkin's Vitamin C Serum isn't just 100% cruelty-free, paraben-free, sulphate-free, lactin-free, gluten-free, and GMO-free... it's also made in an FDA certified facility, ensuring that every bottle of serum you get is at the HIGHEST quality possible. Do not use in conjunction with any other product.